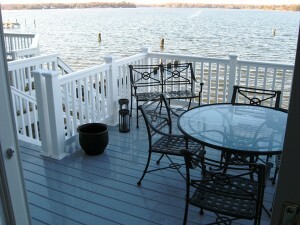 No matter the time of year, your deck should be a point of pride for your home. No matter the time of year, your deck should be a point of pride for your home. However, it doesn’t take much convincing to stay inside because of the bitter cold. Luckily, you still have some ways to make your deck the place to be this winter. Before you go about creating warmth for your deck, consider the materials it is made of; chances are, you have one made of wood. Wood and heat don’t always play well together, but if you do it carefully, then you shouldn’t have to worry. While firepits and portable heaters are good ideas to add to your deck, just avoid exposing the radiant heat to make sure you don’t start a fire. While it’s true that the sun can shine on some days during the depths of winter, you can’t always depend on it. When natural light is insufficient, artificial light can be a worthy substitute instead. As we’ve indicated before, using lights on your deck can show off your sense of humor and your personality. Make the most of your deck and patio, because even during the winter, you’ll want some fresh air from time to time. Lights aren’t the only decorations you can use, either. Now that Christmas and New Years Day have both come and gone, it’s probably time to take down your holiday decorations. Even so, you could always try some other decorative touches you can find through online sources. Just because your landscape has gone dormant for the winter doesn’t mean you can’t still have some bright and cheerful colors adorning your outdoor living spaces or even your outdoor kitchen. By trying plants such as winter jasmine and river lilies, you can transform your deck into a fragrant and verdant hideaway, perfect for escaping those winter doldrums. But to bring it all together, you may need to consider a screened-in porch to help ward off some of the cold.